I don't know about you, but during the warm weather, I like to spend a little time every day in my garden. 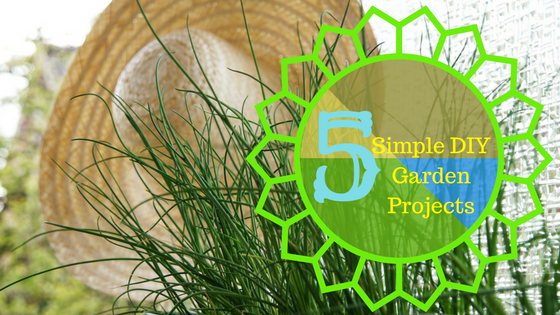 I enjoy getting my hands dirty, spending time in nature, and finding creative ways to improve my garden space. So, today, I'm sharing with you 5 easy ways to do so. Over the years, I've tried lots of different ways to mark my plants. There aren't very many ones that have held up over time. However, these simple markers have lasted the longest, and are really cute and easy to make. It's really just this simple. Write the name of the plant on a brick. If you want a specific style of letters, feel free to use a stencil. Over time, the sharpie will fade, but you can always trace over your original letters again, or leave it faded if you like the way it looks. I do a lot of container gardening because my husband and I rent, and I get attached to my plants. Over the years I've found a few tricks to growing just about everything in a container. 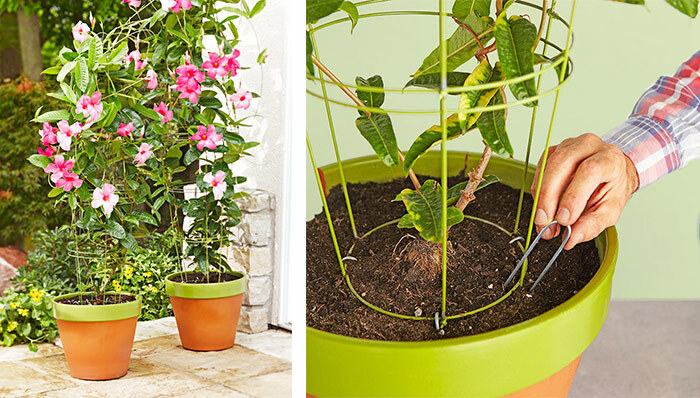 If you want to grow a vine, you need a trellis. The easiest trellis I've ever used is a tomato cage. 2- Nestle one tomato cage inside the other, turning them to make sure the long, vertical wires are alternating. 3- Fasten them with zip ties to hold them in place at the intersections. 5- Bend the legs (from step 1) in half, like hair pins, and use them to stake the tomato cages down into the soil around your vine. You can also make a really tall trellis by using 4 tomato cages and stacking two, upside down, on top of the original 2. 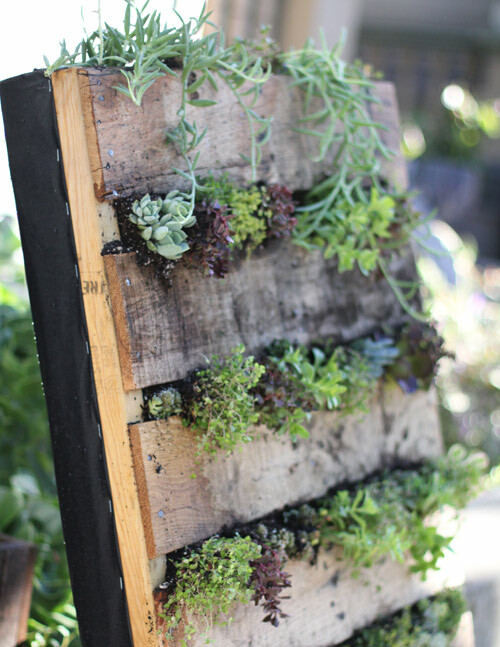 Two awesome trends in home gardening right now are raised beds and vertical gardens. You can use a recycled pallet to achieve both. There are lots of designs, from the very simple, to the not so simple, but I'm going to give you the simplest two designs that I have used. 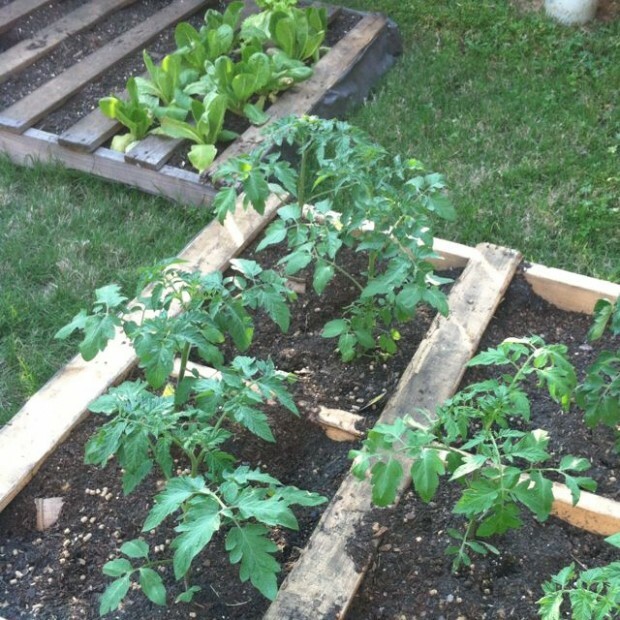 1- The easiest to do is a basic raised bed. Just lay your cardboard over the ground, place your pallet on top, add in the soil and start planting. The cardboard will kill the grass/weeds under your raised bed and will break down over time, improving the soil as it does. 2- The other design can be used either as a raised bed, or as a vertical garden. 1- Place your pallet upside down, if there isn't much support, add some in using scrap wood, just make sure it's even down the back. 2- Double or triple the landscaping paper. Lay it on the back of the pallet and start stapling. I wrap the paper around to the front of the pallet, framing it, to add support and prevent the loss of too much soil. 3- Fill the pallet with soil, and plant you garden! 4- If you want to use it as a vertical garden, after a few weeks (to allow the plants to take root) just prop it up on an outside wall! 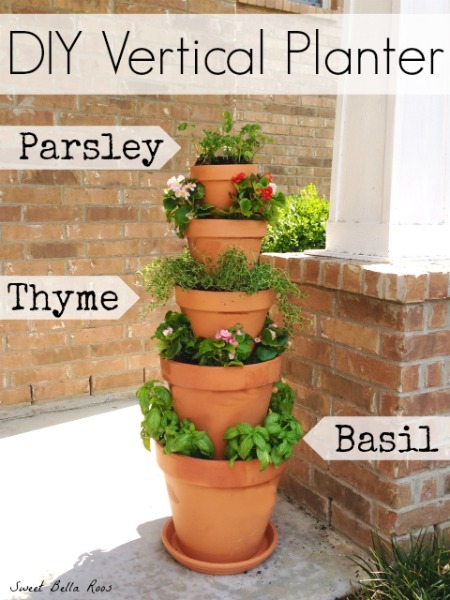 Container gardening is awesome. You can move plants around in your garden without transplanting, you can move them inside, or you can use them to be very decorative. 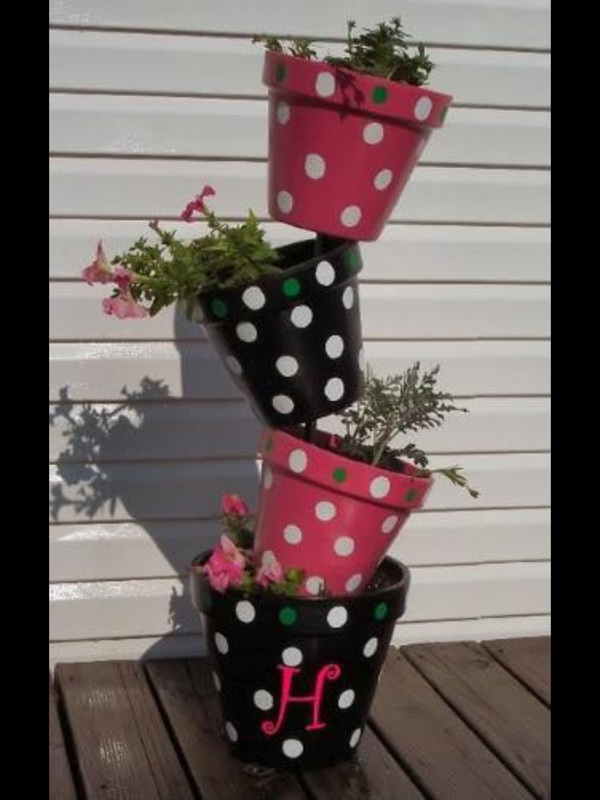 Here are two ideas to use multiple containers to create towers of plants. 1- Optional* Paint/decorate your pots and let them dry. 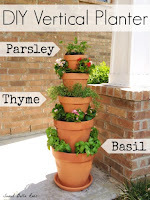 3- Place your pots on top of one another, threading them onto the bar, then filling them ¾ with soil. You can choose to keep them upright, or tilt them for a different, more whimsical look. 4- Continue until all your pots are stacked, filling the top pot all the way with soil. I don't know about you, but I love potatoes. I hate harvesting them though. Or at least I did until I saw a tutorial for making this pot. 1- Using the x-acto knife, cut large squares out of the smaller pot. 2- Nestle the smaller pot in the larger pot. 3- Add soil and get to planting! 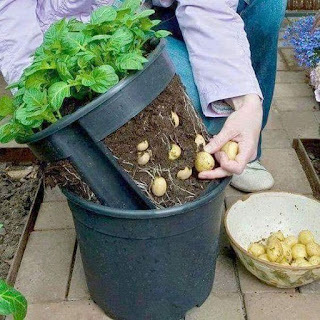 4- When it's time to harvest, just lift the smaller pot out and pick the potatoes out of the sides. I hope you find these ideas helpful and fun. If you have any questions or comments, please leave them below!